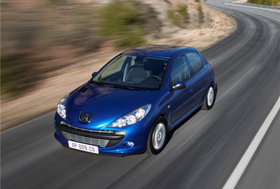 Peugeot's 206+ will have "accessible" pricing below the 207. PARIS -- Peugeot plans to sell a low-cost version of its 206 small car called the 206+ starting next month. Peugeot Managing Director Jean-Philippe Collin said the 206+ five-door hatchback will be an entry product for the European market. The 206+ will have "accessible" pricing below that of the 207 and above the 107 minicar, Collin told Automotive News Europe. "The idea is to have a whole range of small cars, for all uses, from the 107 to the 207, with the 1007 and the 206+ in between," Collin said. "This way we cover the whole segment." The 206+ was developed from the 206, which has sold more than 6.5 million units worldwide since its 1998 launch. The new version has revised external styling, including a re-sculpted hood, a new radiator grill and upgraded headlights. Inside, it sports a new dashboard and decorative touches that evoke the world of motorcycles. Manufactured at PSA/Peugeot-Citroen's Mulhouse factory in eastern France, the 206+ will offer a range of small engine choices aimed at limiting costs and keeping CO2 emissions down.